A review of the empirical evidence in Hanes (1992 and 1993), Wood (1909), and Feinstein (1990) shows both the UK and US in the late 19th and early 20th centuries had already developed a significant degree of downwards nominal wage rigidity. 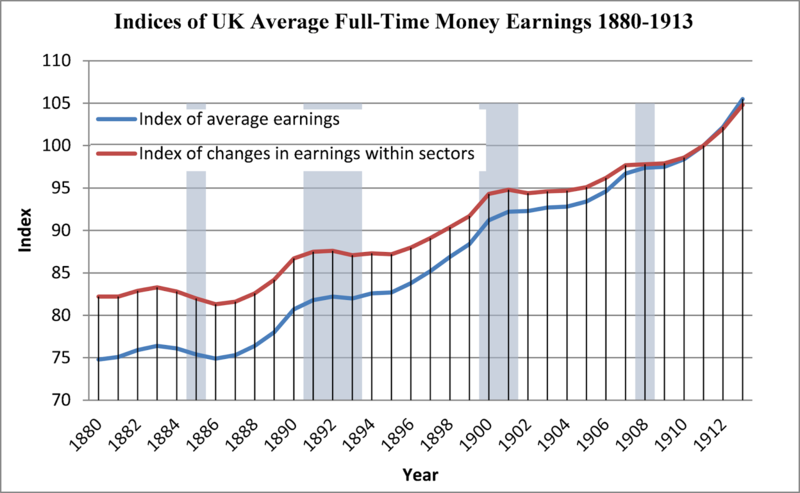 The data for the UK can be seen in the graph below, which shows both an index of average UK weekly money earnings and of changes in money earnings within sectors (from Feinstein 1990: 612, Table 6). UK recessions are shaded in blue. 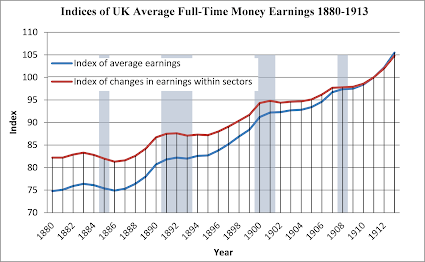 The data in Wood (1909), which can be seen here, indicates that UK money wages did fall significantly in the 1875 to 1879 period. But in the mid-1880s recession nominal wages fell only mildly, and in the 1890s recession hardly moved at all. 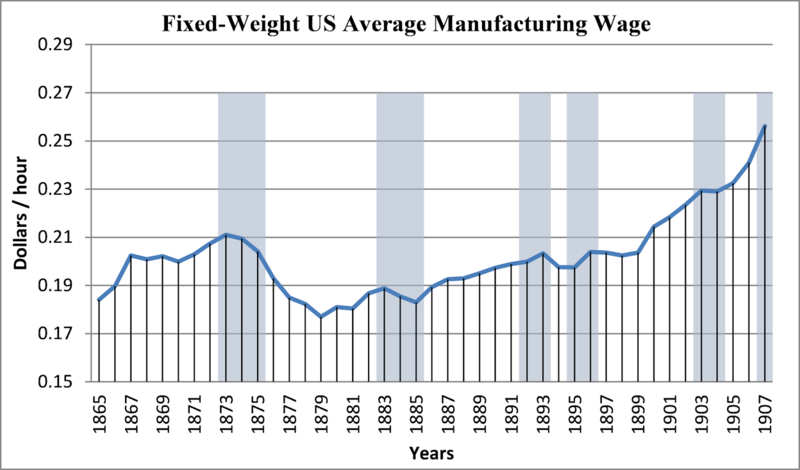 In the recessions of 1900–1901 and 1908–1909 money wages were again essentially level and inflexible downwards. Now for the US data. 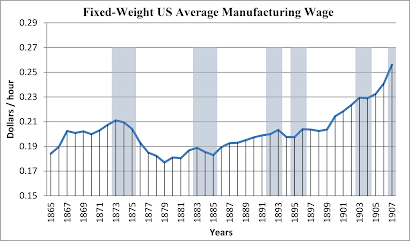 The graph below shows fixed weight average US manufacturing wages (dollars per hour) from Hanes (1992: 276–277, Table 3 and Hanes 1993: 753, Table A1). The recessions in Davis are shaded in blue. US money wages did fall considerably in the economic troubles of the 1870s, but, despite that, there were still protracted economic problems and rising unemployment in the US for years on end in this decade (see the evidence here and here). Nominal wages only fell mildly in the recessions of 1883–1885 and 1892–1894. In the 1895–1896 recession, money wages rose, and in the recession of 1903–1904 they were level and inflexible downwards. Downwards nominal wage rigidity was a reality both in the UK and America, the two most advanced capitalist economies, well before 1914. In fact, it seems to have become highly significant even by the late 19th century. In America, the degree of money wage falls in the recession of 1920–1921, coming as it did after the unusual wartime wage and price inflation of 1914–1918, was actually anomalous even at that time. 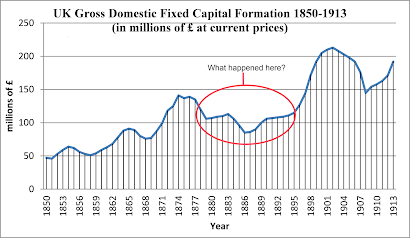 While not related directly to this post, I have been looking at UK gross domestic fixed capital formation from 1850 to 1913, in the context of the 1873 to 1896 deflation, so I can see the long-run trend. This graph shows UK gross domestic fixed capital formation in millions of pounds at current prices from 1850 to 1913. The fall in investment around 1874 to 1896 sticks out like a sore thumb. What happened here and why? That is a question I will ask in a subsequent post.